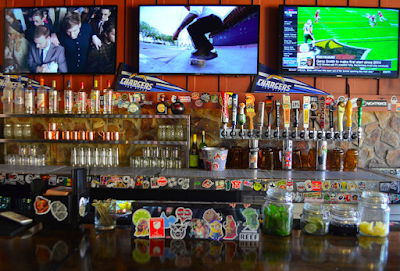 The owners of The Waterfront, Werewolf, Harbortown Pub and more have opened Banzai Bar at 3048 Midway Drive in San Diego's Midway District at the location that formerly housed Shakedown Bar, with a grand opening party scheduled for October 21. The 1,300-square-foot eatery boasts a Japanese/Hawaiian themed menu and includes an outdoor patio and bar and an arcade game room, as well as a devotion to San Diego craft beers and a lengthy list of custom cocktails. 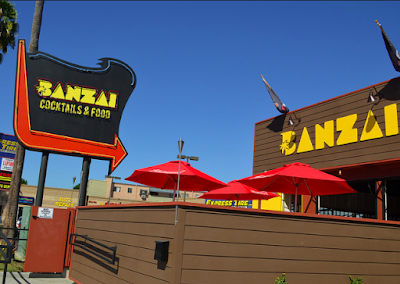 Appropriately named after the Japanese phrase used during celebrations and cheers, Banzai has recently opened up in the Midway District bringing a splash of Asian culture to this local neighborhood. Banzai is the new brainchild of Chad Cline and Jason Nichols, two cousins behind the Waterfront family of restaurants, known for San Diego establishments such as Eastbound, Harbor Town Pub, The Hills Local Pub, Club Marina, Werewolf and The Waterfront, which is the oldest tavern in San Diego. The spicy new bar and restaurant is making an appearance with a bang, hosting a Grand Opening party on October 21, starting at 6pm. Get ready to sake sake sake, as Banzai Bar will be attempting to break the Guinness World Record for the number of consecutive sake bombs with the help of the party attendees joining in on the fun every two hours - at 6pm, 8pm, 10pm, 12am. In addition to all of the Guinness World Record madness, there will be entertainment by a live DJ. The menu was created by owner Chad Cline’s wife who used inspiration from her Japanese heritage and upbringing to create out-of-the-box recipes. Patrons can expect American classics with an Asian twist, from burgers and burritos to tacos and bowls. Items include Bahn Mi Sliders with pickled carrots, cucumber, cilantro, jalapeno and dojo sauce, and the Poke Bowl with pickled carrots, grilled pineapple, edamame, cilantro, wasabi cream and crispy garlic. Customers are invited to wash it all down with the carefully crafted cocktail list of crazy creations such as the Bonzer cocktail with Kraken Rum, coconut syrup, orgeat, egg white, angostura bitters, lime and sugar. For more information on Banzai Bar, visit banzaibar.com.